Continuing the recipe posts from my Father's Day Feast... here is the salad I made! Rocket, manchego and pear salad with maple-glazed walnuts. In the lead-up to the lunch, I was emailing my friend Lisa, asking if she had any suggestions for dishes - and she suggested a "fresh pear, Manchego cheese, and arugula salad with caramelized walnuts and warm walnut vinaigrette", from the rather fabulous-sounding book: Caramel, by Trish Deseine. The recipe looked delicious, but was quite long and complicated (you had to make a caramel from scratch to coat the walnuts), and had expensive / obscure ingredients like walnut vinegar and walnut liqueur. With so many other dishes to make that day, I didn't want the salad to drive me over the edge, so I simplified it heaps - I used the base ingredients as my inspiration, but didn't bother with the caramel or the vinaigrette. 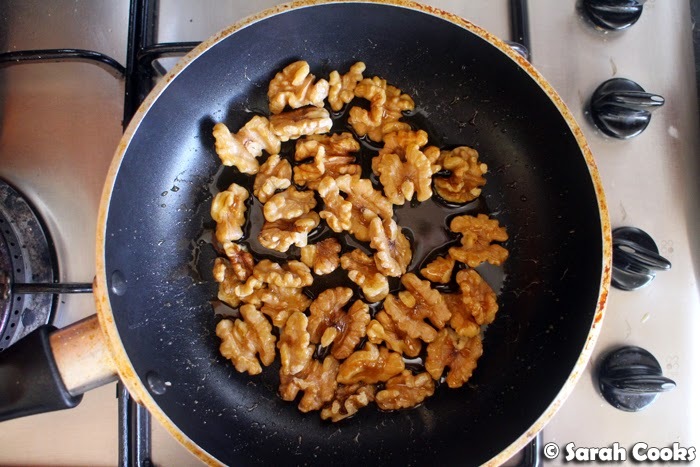 Instead, I used a too-easy dressing of lemon juice and extra virgin olive oil, and toasted the walnuts in maple syrup. ...and keep cooking and stirring until the maple syrup is all caramelised and crunchy. They're so addictive! And so much easier than David Lebovitz' equally fabulous candied peanuts. They're good in the salad, but also make a totally compulsive snack. I imagine they'd be great on top of vanilla ice-cream too! The salad was so fantastic! I loved the combination of peppery rocket, crunchy sweet walnuts, juicy sweet pear and the nutty, creamy manchego. The mixture of sweet and pepperiness complimented the rich pork well, and I imagine the salad would do well against any rich meat - pork, goose, duck, anything like that. Enjoy! Place the rocket in a large bowl. Finely slice the pear and add the slices to the bowl. Using a clean vegetable peeler, slice up the Manchego and add it to the bowl. (Save a few slices for decoration). Squeeze in some lemon juice and drizzle with extra virgin olive oil, and season with salt and pepper to taste. Toss everything together to coat. Add the maple glazed walnuts (saving some for the top) and toss again. 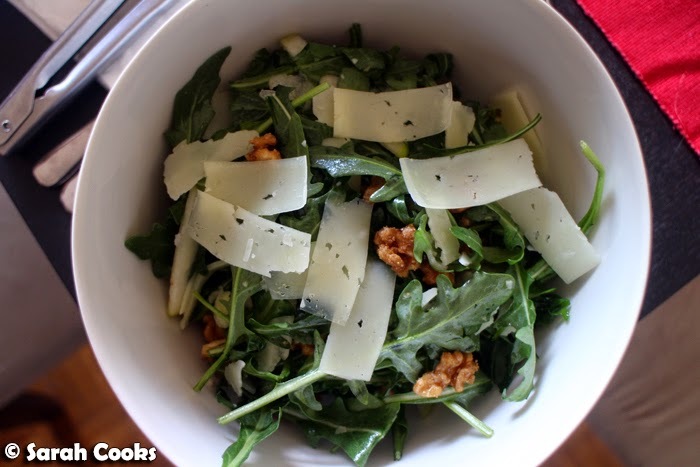 Tip the salad into a serving bowl or plate, and top with the remaining shavings of Manchego and the remaining walnuts. I love the sound of this salad and I would totally love those crunchy sweet walnuts! Heaven! Oh I wish you didn't tell me how to toast nuts with maple syrup...I think I'm going to be eating fistfuls of that from now on! This salad looks great to me! 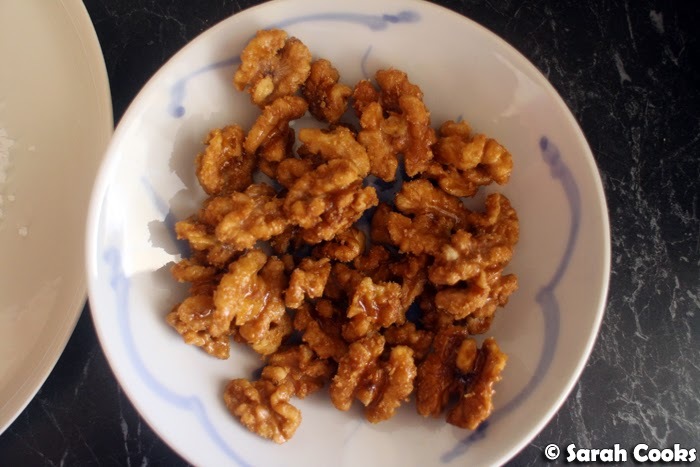 Oh and I love those crunchy sweet walnuts!